Allied Towing specializes in abandoned vehicle impound services, and has worked with customers in the area of abandoned vehicle removal since 1985. If you are an Arizona business or commercial property manager or owner, you can depend on our professional services when you need abandoned vehicle pick up! Our team of professionals make the process easy and efficient; in most cases, we will remove an inoperable, illegally parked or abandoned vehicle within 24 hours of your call. 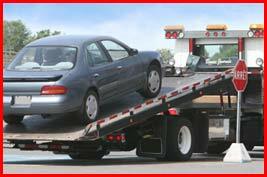 For more than 25 years Allied Towing has been in the business of abandoned car impound services and removal. 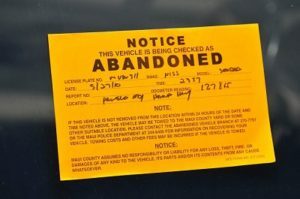 We understand that Arizona business owners and those in property management often have problems with vehicles that have been abandoned, or that are inoperable or illegally parked. This can be a real nuisance to you, and to others that utilize your property. When you are in need of abandoned car pick up, count on our professional team to take care of the job quickly and efficiently. If you are an Arizona property owner or management company, count on Allied Towing for dependable, efficient shopping center vehicle removal. For more than 25 years, we have helped management companies and owners rid their property of illegally parked, abandoned and inoperable vehicles. We know that vehicles that are left on the grounds can leave your property looking cluttered and unsightly; not only that, you could be held liable should damage occur. When you are looking for professionals that specialize in shopping center car towing, count on the professionals at Allied. At Allied Towing, we understand that abandoned or inoperable junk and scrap vehicles can be a real nuisance - and a liability to your company. Cars, trucks, RV's, trailers, motorcycles and other vehicles can often clutter up your property, making it look unsightly. Since 1985, our scrap vehicle removal services have helped thousands of Arizona property owners and management companies with scrap car removal and impound. Are you looking for a company that specializes in Arizona property vehicle removal and impound? At Allied Towing, we have been in the business of property car towing for over 25 years. Our professionals are dedicated to making property car removal and impound an easy, stress-free process. No matter what type of property you have, we can clear the clutter quickly, efficiently and in a professional manner. At Allied towing, we are proud to offer rental property vehicle removal to those with rental property in Arizona. Since 1985, our rental property car towing services have helped thousands of property owners get rid of abandoned, illegally parked or inoperable vehicles that were cluttering up the grounds. Not only do "junk" or abandoned cars, trucks, vans, motorcycles and other vehicles create an eye-sore on your property, they can also leave you liable for any damages that may occur. 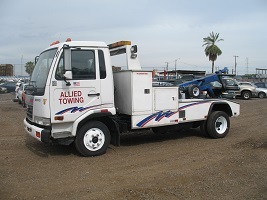 Allied Towing has been in the mobile park vehicle removal business for more than 25 years. We are glad to offer our services to anyone who desires that an abandoned or inoperable vehicle be removed from the premises. If you are in search of mobile park vehicle towing services, we are the team for the job. Our experience, skill and reliability have made us the preferred company for towing/impound services since 1985. Whether you are an apartment property owner or manager, or an individual living in an apartment who needs your vehicle towed, Allied Towing specializes in apartment vehicle towing. Since 1985 our company has offered apartment car removal, helping managers/owners keep their property clean and neat, and individuals get their cars to another location in a quick, easy manner. When you are looking for a service that offers apartment vehicle removal, you can depend on our professionals to take care of the job. Allied Towing specializes in property management vehicle removal and impound, and has proudly been serving Arizona customers since 1985. When it comes to property management car towing, we are the experts. Our team of professionals work to clear your property of unwanted "junk," abandoned, illegally parked or inoperable vehicles. We realize that these cars, trucks, motorcycles and other vehicles can be a real eye-sore, detracting from the neat, clean appearance of your property. Phoenix, Mesa, Chandler, Gilbert, Tempe, Scottsdale, Cave Creek, Glendale, Surprise, Peoria, Maricopa, Avondale, Goodyear, Litchfield Park, El Mirage, Sun City and More! Mobile Home Parks, Apartment Complexes, Store Fronts, Shopping Centers, Offices, Security Companies and More!